Born May 21, 1933 in Concord, New Hampshire. New Hampshire is a great state with beautiful mountains, lakes, skiing and fishing. How you gonna be a rockabilly star in this beautiful country? Well, maybe by being inspired by Johnny Ray, Gene Vincent, Buddy Holly, etc. Gene tried in every way. He traveled around the area, performing in local bars while searching for a record contract. The people who heard Gene, told him to go to Nashville. So, at a young age, he did. 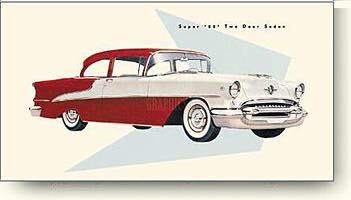 He traveled in his '49 Chevy , used the car as his sleeping place, and did a lot of odd jobs earning money to stay alive. It may be a story like many young stars, but Gene was different, blessed with a great voice and writing all his own material. It was Decca Records were Gene received his first recording break. Chet Atkins told him how hard it was to break through. Chet brought Gene to the "Cedarwood Publishing Company" and there he sang "Crazy Baby." Webb Pierce walked by the room and taped "Crazy Baby" using a small tape recorder. Webb phoned Paul Cohen and history was written then. 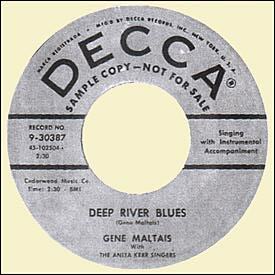 Gene's first record came to be, after a Brenda Lee session on April 19, 1957 in the Bradley Studio, 204 16th Avenue South - they cut "Deep River Blues b/w "Crazy Baby," Decca 30387. The Anita Kerr Singers did the backing vocals. The whistling on "Crazy Baby" was performed by Gene himself. But Decca didn't do much to promote the record as they were too busy with other artists. Gene went back to New England to play in bars and clubs throughout Boston and New Hampshire. He picked up the name ... "The King of Rock 'n' Roll in New England." Gene went west and on to Hollywood where he did jobs like being a bellhop at the Challenger Inn at Sun-Valley, a chauffeur at the Eldorado Lodge in Tuscon and later, a police officer - the job he liked the most, after singing and writing of course. He met Tony Hilder who introduced him to "Aladdin Records" where Gene wrote songs for other artists. John & Jacky recorded two songs of his - "The Raging Sea" and "Little Girl." Aladdin 3425, released in May of 1958. But, Gene didn't like the way Aladdin handle his songs and didn't sign a contract. The Raging Sea is the most wanted recording of Gene. Many radio stations all over the globe play that song ... Australia, Belgium, Polen, Netherlands, etc. 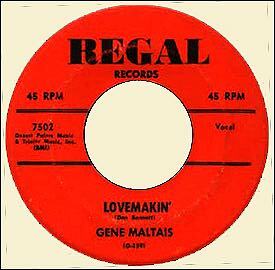 Gene's second recording was Regal #7502, "The Bug: b/w "Love Makin'." Billboard magazine wrote" "Love Makin'": "blues, chanted with a swinging quality by the vocalist ... backing drives." "The Bug": Driving blues, lyric has some novelty quality, arrangement moves right along with funky guitars." Gene started his own company and recorded "The Raging Sea" b/w "Gang War" on his own label, Lilac #3159, in 1959. Records of Gene are very rare. 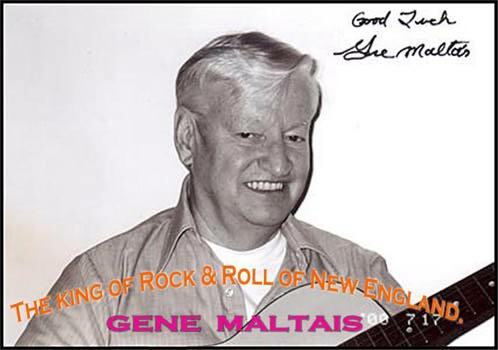 Gene also had his own TV show, "The Gene Maltais Variety Hour." But bad luck and questionable working associates may have been a factor in Gene not getting the recognition he deserved. Gene still writes and lives with his lovely wife in Suncook, NH. His life story would have made a great movie!! Born 21 May 1933, Concord, New Hampshire - Gene developed an interest, like so many others, whilst in school and started playing in a local restaurant. However having completed his education, he decided he wanted to see some of the USA and started to travel picking up work as he went but eventually returned to New Hampshire. 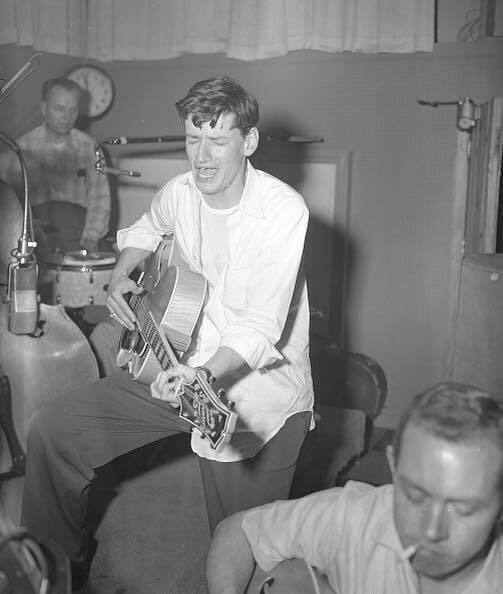 Here he started to hone his musical skills but it became evident that he was not going to get the break he wanted and so hitch- hiked to Nashville in 1957. He knocked on the doors of many of the record companies but often failed to get past the receptionist. Finally, he managed to get a secretary at Decca Records to listen to him. As luck would have it, Webb Pierce was walking by as he was singing 'Crazy Baby'. Being duly impressed, Pierce contacted Decca president Paul Cohen in New York and an appointment was made for Cohen and Maltais to meet when the latter visited Nashville two days later. Cohen signed Gene and a session was arranged for the next day, 19th April 1957, following a Brenda Lee recording date. 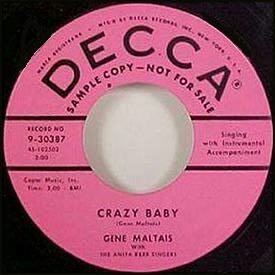 The tracks 'Crazy Baby' and 'Deep River Blues' were laid down and issued on Decca 30387. Backing musicians included Hank Garland on lead guitar and Owen Bradley on piano. These are two great rockin' sides that were eventually issued about six months later but which failed to achieve the predicted chart making impact. 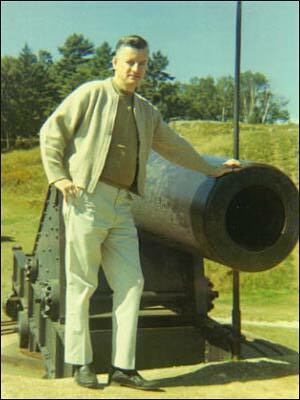 In the interim Gene had returned to the Manchester area of New Hampshire and became a 'must see' attraction. When it became apparent that his name was not going to be in lights nationally from the Decca record, Maltais headed out for the West coast. Here he knocked on the doors of several record companies, one of who was Aladdin who got their artists Johnnie & Jackie to record Gene's songs 'Gang War' and 'The Raging Sea'. However, he returned to New Hampshire but then quickly decided to head out west again. 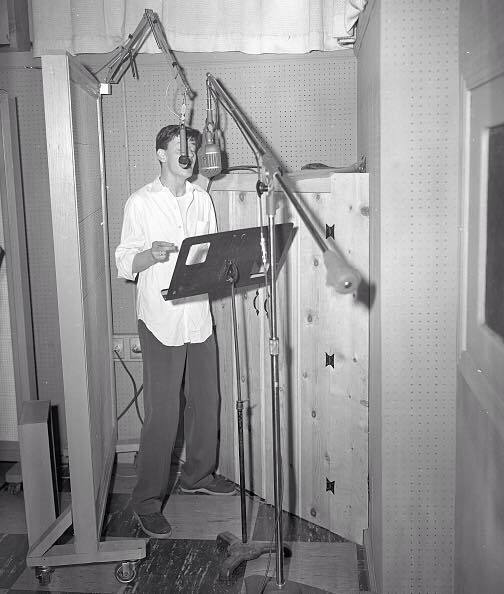 Here he made contact with the Phoenix based Regal Records and on 28th December 1957, he entered the Ramsey Recording Studio and cut 'Lovemakin'/The Bug' (Regal # 7502). There is a mystery as to who played lead guitar on the session. 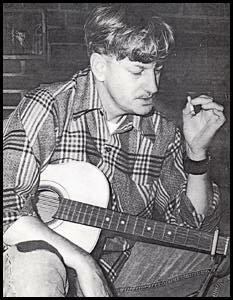 Gene recalls that it was Duane Eddy but the session log states Al Casey. Whist being a very tasty record, it stiffed nationally and so it was again a return to New Hampshire. Gene decided that he should now record his own version of 'Gang War' and 'The Raging Sea' with his Gibson String Band that he released on his own Lilac Records (#2159) but with less than 1,000 copies being pressed. (Much later on, it was re-released on the Massabesic label). Maltais then carved out a performing circuit for himself, in Boston and other East coast cities and carried on performing well into the sixties. Recording-wise, apart from an isolated demo session in 1965, Gene did not return to the studio until 1975 and it was for a session in Belgium supervised by Mac Bouvrie. Three sides were laid down with 'Rock And Roll Beat/The Raging Sea' being issued on Monopole 452 whilst 'Begone Come The Dawn' saw the light of day on Monopole 612. 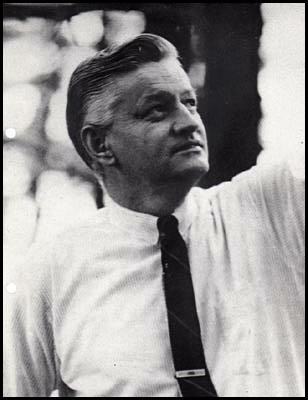 Gene had set up his own business and had become involved in local New Hampshire politics and charity work. However, he still had the music bug and so in 1994, he recorded 'Voodoo Woman' and 'Little Girl' for Billy Millers New York based Norton Records (#45-029). He has also made several demo sessions through the years. A compilation of his recordings will soon be available on Hydra Records out of Germany. He is unfortunately another of those stories of a guy with a considerable rockin' talent but who was unsuccessful in achieving the big break. Norton CD 226 - 'The Raging Teens Vol. I' contains 'The Raging Sea' and 'Gang War'. 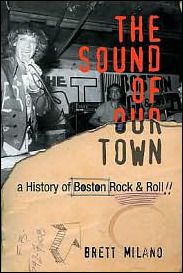 "The Sounds of Our Town, The History of Boston Rock and Roll." The book can be purchased on the Barnes and Noble Book Store Web-site for 24.95. Visit this link.